This election year, Republicans and Democrats will agree on little, including how to get the U.S. economy growing. Higher taxes or smaller government? One path to growth that is widely agreed upon is technological innovation, which has historically been closely associated with the American venture-capital-backed startup company. A single dollar of venture capital, one study suggests, is as effective at boosting new ideas as three dollars of corporate investment in R&D. If we listened to trade bodies such as the National Venture Capital Association, we might conclude that to get more innovation, all we need is more venture capital. But claims that venture capital is a driver of true innovation, or even of positive financial returns to investors, face some hard questions. With the industry facing a hangover from its recent flurry of social-media investing and the disappointing stock-market performance of firms such as Groupon, Zynga, and Facebook, the skeptics have rarely been as loud as they are today. Historical data bear out the trend. In 1974, the fraction of venture capital investments primarily involving computers and telecommunications was only 35 percent, a share that climbed to 62 percent in 1982 (as excitement grew around computer peripherals) and finally reached 79 percent during the dot-com boom in 2000 before subsiding temporarily. The figure has rapidly climbed again, reaching 56 percent in 2011. And that may yet mask the rise of social-media investing, which fits poorly into traditional classification schemes. Even within other categories, venture funding is highly concentrated. In the energy sector, venture funds have overwhelmingly gone to renewable and “smart grid” technologies rather than those related to conventional power generation. What explains this dramatic concentration? One answer is that venture funds have done much better in categories where the innovation cycle is short, such as media and software, than in areas like advanced materials and biotechnology, where the time frame for success is longer than the eight-to-10-year life of the typical fund. Estimates assembled by the consulting firm Sand Hill Econometrics, which examined the relative performance of all venture investments, show that a dollar invested in 1991 in venture-backed software firms would have turned into more than $23 by the end of 2011 (before the venture funds took their fees and cut of the proceeds), for an annual return of close to 19 percent. Venture investments in health care and retail had an annual return of 10 percent over this period (again, before the fees), while a similar investment in the bedraggled “other” category—which includes energy, transportation, and many other areas—returned only 6 percent. Once the venture capitalists’ annual fees (which typically run about 2 percent of the capital under management) and profit share (20 percent or more of the capital gains) are factored in, the performance difference would be even bigger. The apparently limited power of the venture capitalists’ “pixie dust” only serves to concentrate their efforts further. Groups specializing in computers and telecommunications have had superior returns, which has allowed them to garner more money. Others struggle, disappear, or reinvent themselves as mainstream investors in popular categories. Another problem is that the venture market is extraordinarily uneven, moving from feast to famine and back again. Consider the tremendous surge in funding for biofuels, which peaked in 2006, and again in social-media companies during the last two years. During booms, unjustified exuberance rules. 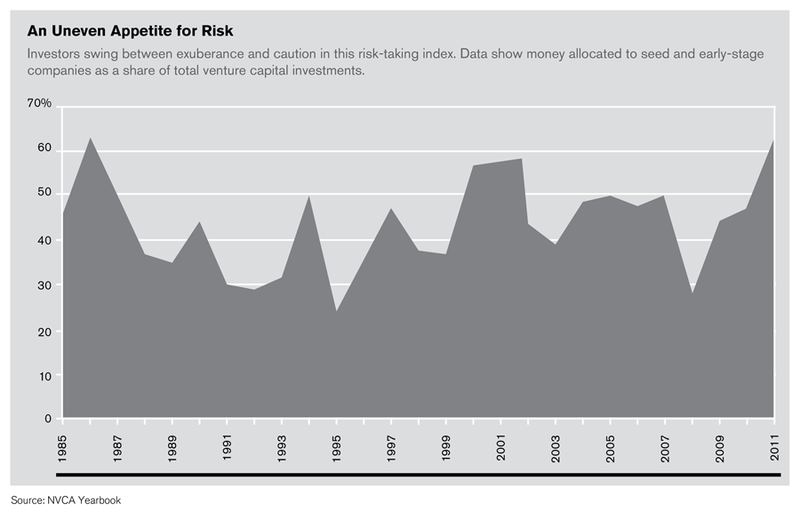 A common phenomenon is known as “money chasing deals.” As more money flows into funds from institutional and individual investors, venture capitalists are willing to invest in ever riskier deals (and often on worse terms): the share of first-round venture dollars going to seed-stage companies—those whose prospects are least certain—has varied from a low of 24 percent in 1995 to a high of 58 percent in 2000–’01. What about today? The percentage has climbed again, reaching 61 percent in 2011. Moreover, this risk-taking is not rewarded: returns in boom years such as 2000 are among the lowest seen in any period. 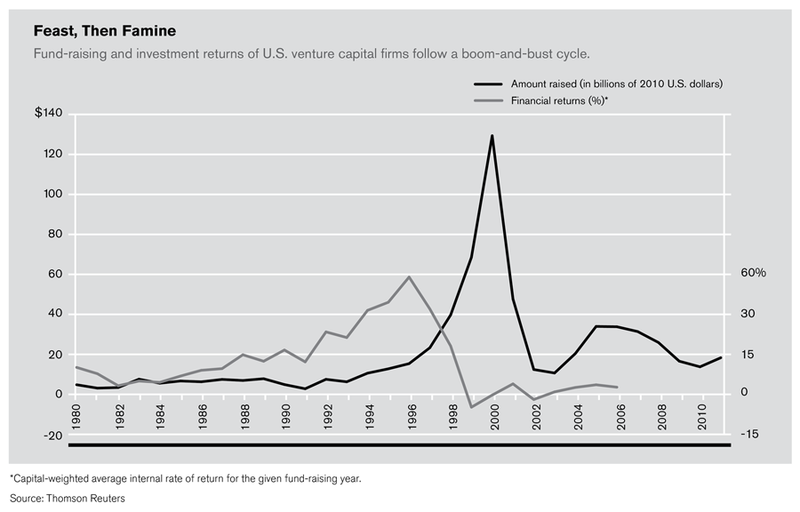 Cycles in the venture industry stem largely from the behavior of funds themselves. During hot markets, inexperienced groups raise capital, often from unseasoned investors who are attracted by the excitement—not appreciating that first-time funds often show weaker performance, particularly in hot markets. Name-brand groups, too, often take advantage of exuberant markets to raise money aggressively, perhaps because partners’ compensation is driven by fees on capital under management. As venture groups grow, they increase the capital that each partner is responsible for and broaden the range of industries in which each invests. In other words, what starts as a trickle ends as a torrent. Ultimately the expansion proves unsustainable as investment returns fall. Then the cycle repeats itself all over again. Whatever the precise mechanisms behind the boom-and-bust cycle, its impact on innovation is worrisome. For instance, during the deep venture trough of the 1970s—no venture capital funds at all were raised in the United States in 1975—many companies that sought to pioneer personal computing languished unfunded. Ultimately, these technologies surfaced with revolutionary impact in the 1980s, but their emergence might have been accelerated had the venture market not been in such a deep funk. It is hard not to feel that many long-term, expensive investment areas, such as clean tech, manufacturing, and biotech, are in exactly such a trough today. The overfunding of startup firms during booms carries its own negatives. Examples include the frenzy surrounding B2B and B2C Internet companies in the late 1990s. The result is waste: multiple companies pursue the same opportunity, each often more marginal than the last. The initial market leader’s staff is poached by the me-too followers, disrupting the progress of the firm with the best chance of success. Moreover, once the overfunding subsides, the firms that still survive struggle to attract funding in an atmosphere that is now often poisonous. So when do booms turn to busts? 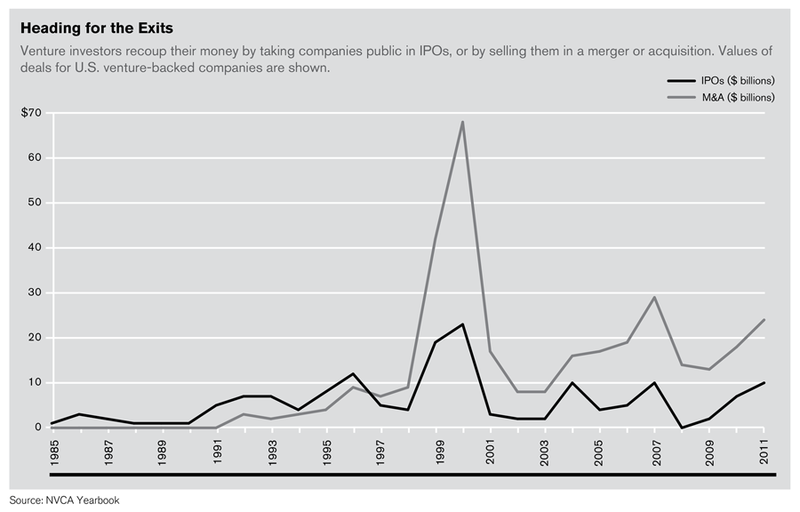 Venture capitalists depend critically on acquisitions and the public stock markets to help them exit their investments and return capital to their investors. But the public markets are fickle. During the past decade, soaring enthusiasm—for clean tech in 2006–’07 and social media in 2010–’12—each time abruptly subsided, leaving the portfolios of venture capitalists, and stock investors, in shambles. Ironically, busts may promote innovation precisely because they frustrate venture capitalists’ efforts to exit their investments. A myriad of accounts and studies have suggested that public listing may act as a powerful deterrent to innovation. In recent years, firms from Pfizer to Yahoo have slashed their R&D budgets in hopes of pleasing stock investors. More generally, the latest academic research suggests, venture-backed companies that consider going public but abandon the efforts in the face of unfavorable market conditions are actually more innovative. Senior partners at an established venture firm are likely to have a pretty sanguine view of their own (and their partners’) ability to effect positive change in the firms they fund and in society at large. This is understandable: one is unlikely to be successful at committing skittish institutions’ money to nascent startups without a considerable degree of self-confidence. But the venture capital model is no panacea for innovation. The boom-and-bust cycle, the mercurial effects of public markets, and the narrowing of its objectives have made it something far less substantial. Josh Lerner is the Schiff Professor of Investment Banking at Harvard Business School and the author of The Architecture of Innovation (Harvard Business Review Press, 2012).